1. At no point last season did the Chargers look as bad on film as they did in the standings. Despite the offensive line and receiving corps being ravaged by injuries, they still had a professional, competitive offense. Yes, it’s an offense that needs to get better. But it certainly did not need to be overhauled. Kudos to Dean Spanos for bringing back head coach Mike McCoy and quarterback Philip Rivers. He realized that the Chargers last year were just one of six teams in NFL history to lose at least eight games by seven points or less. With Rivers at the helm, better days are ahead for the Chargers. 2. 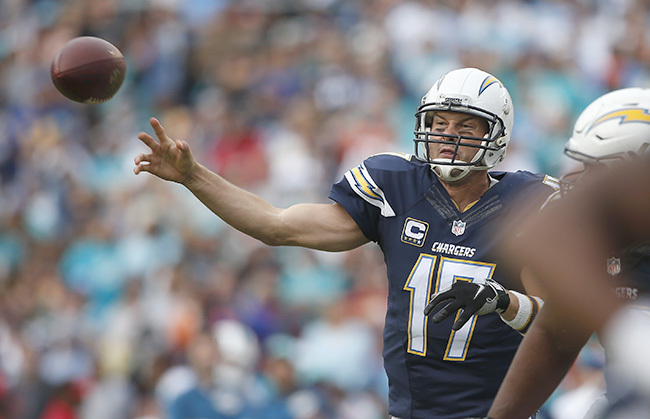 With Rivers at the helm, the Chargers are capable of winning any game. Pardon the term, but he’s “elite.” He handles the full gauntlet of pre-snap responsibilities, from protections to route adjustments to full-fledged audibles. He’s willing to not just throw with unblocked defenders screaming at him, but throw downfield and with anticipation (especially outside the numbers against zone). All are marks of big, big-time quarterbacking. 3. Something else Rivers does well: He gets to his checkdown quickly. This might seem innocuous. It’s not. One of the hidden traits of shrewd quarterbacking is being able to quickly determine which routes are not open. The better you do this, the smoother you’ll be working to your checkdown. And checkdowns are a meaningful part of San Diego’s approach. In fact, they’re a large reason why Danny Woodhead led all running backs with 755 receiving yards last year. 4. San Diego’s most dangerous formation is the 3 x 1 set with the “3” being three wide receivers and the “1” being tight end Antonio Gates flexed a yard or two out. They’ll offset the running back to Gates’s side to present a second receiving threat here. This unbalanced look forces the defense to reveal its coverage (if the corner stays to Gates’s side, it’s zone; if the corners all follow wide receivers over to the other side, it’s man). It also sets up the crossing patterns, backfield releases and tight end corner routes that comprise so much of McCoy’s quick-strike offense. 5. The addition of free agent slot corner Casey Hayward suggests the Chargers are preparing to play more man coverage this season. We saw glimpses of this in the second half of last season with Jason Verrett and Brandon Flowers. Verrett, in fact, traveled with opposing No. 1 wide receivers and usually won those battles. He’s the best corner that no one knows about. Like Flowers, and of course like the ex-Packer Hayward, Verrett can slide into the slot. And so you have three flexible corners who can match up anywhere on the field. The Chargers know firsthand how valuable this is; after all, they face the Broncos twice a year. 6. More man coverage will mean more blitzing. That’s defensive coordinator John Pagano’s M.O. Pagano loves deception and disguise. Last year he did not dial it up as often (or as successfully) as he usually does. I’d bet you he tries to make up for that. 7. The challenge will be employing the disguises without Eric Weddle. He was an extension of Pagano on the field. No safety of this era, save for the now-retired Troy Polamalu, has been as cagey and exaggerated in personal presnap disguise tactics as Weddle. Now he’s a Raven. In his stead is journeyman Dwight Lowery, who will team with up-and-down thumper Jahleel Addae. You can expect Pagano’s disguises to now come more from his front seven and less from his secondary. That’s okay if you’re in man coverage. 8. Last season, for the first time in his career, former first-round pick Melvin Ingram posted numbers that were commensurate with his physical abilities. It helped that Ingram was healthy for all 16 games for the first time since his rookie year. He yielded 10.5 sacks off the edge, surpassing his career total by 4.5. Ingram can be even better than this. Tremendous lateral explosiveness allows him to win one-on-one outside and also redirect back inside, including on gap-exchange designs like stunts and twists. And the Chargers have another player built for these moves on the other side: Jerry Attaochu. He’s not as dynamic as Ingram, but he’s longer and (potentially) smoother. Attaochu had six sacks himself in 2015. He’s capable of posting double digits. Just like how the Chargers can mimic the Broncos in man coverage, they can also mimic them in the pass rush by stunting their edge rushers inside as part of their blitz designs. 9. Manti Te’o has blossomed into a nice three-down NFL linebacker, something many scouts and draft analysts didn’t think he was quick or agile enough to be. Te’o is not a dynamic passing-down linebacker—he struggles against route runners who can change directions smoothly—but his improved sense for keying and diagnosing play designs allows him to stay on the field. That will be the case if the Chargers play nickel in 2016. Pagano prefers dime, but he might not have enough depth at safety for that. 10. For all his progress, Te’o will be only the second-best linebacker on this team. Last year’s second-rounder, Denzel Perryman, can be a star. Perryman plays low and with great balance, particularly in traffic. He has traits reminiscent of Jessie Tuggle, the Falcons Pro Bowler in the 90s.